Gandhinagar Municipal Corporation Recruitment 2018-2019: Aspirants who are searching for the latest Government Jobs they can apply for the Gandhinagar Municipal Corporation Recruitment 2018. The corporation of the Gandhinagar Municipal Corporation had declared a recruitment notification to recruit the candidate for 126 Health Officer, Sanitation Superintendent, Jr. Town Planner, Zonal Officer, Veterinary Officer, Administrative Officer, Clerk, Sanitary Sub Inspector, Sanitary Inspector, Sr. Clerk, Tex Inspector, Sub Auditor / Sub Accountant, Surveyor / Draftsmen, Planning Assistant, Electrical Data Processing Manager, System Analyst / Sr. Programmer Jobs. Before going to apply need to check the complete notification which is given in this article so that applicants can get more information about the Gandhinagar Municipal Corporation Recruitment 2018 Notification. The application process is going to start on 27th March 2018, and the application process will end on 10th April 2018. To know the additional details about the Eligibility Criteria, Education Qualification, Age Limit, Vacancies Details, Salary Details, How to Apply steps are provided on this page about Gandhinagar Municipal Corporation Recruitment 2018-2019. The aspirants who are applying for the Gandhinagar Municipal Corporation should qualify in any Under Graduation or Post Graduation from any reputed university is the desired educational qualifications are eligible to apply for these Gandhinagar Municipal Corporation Recruitment 2018 before the last date of the application. Along with the educational requirements, you can also satisfy the age limit as mentioned in the Gandhinagar Municipal Corporation Openings 2018. So the applicant’s minimum age limit could be 18 years while the maximum age should be 40 years. However, after the completion of the online registration process, the organization is going to conduct the recruitment rounds for all the candidates who will submit the applications before the last date. So the organization is going to conduct the Written Examination and Interview as the recruitment process. And all the Important Dates are mentioned below in this article. Contenders must need to participate in the selection process to get placed into the organization. The aspirants who have applied must pay the application fee as per the official norms. Follow the official notification for the upper age relaxation. Go throughout this page entirely for the more data of the Gandhinagar Municipal Corporation Recruitment 2018-2019. The applicants who belong to Gujarat State those get a good chance of getting a job in Gandhinagar Municipal Corporation. The organization had released Gandhinagar Municipal Corporation Recruitment 2018 Notification for 126 Jobs. The application form submitting is already started, so aspirants who are interested then apply for a job before 10th April 2018 is the last date for filing the application form to the Gandhinagar Municipal Corporation. The contestants can stay with our website Sarkari Recruitment or with the official website of the Gandhinagar Municipal Corporation for getting more latest news about Gandhinagar Municipal Corporation Recruitment 2018 notification. The Gandhinagar Municipal Corporation has revealed the latest recruitment notification for the contenders. By reading the full details in the notification, the willing aspirants can apply for Gandhinagar Municipal Corporation Recruitment 2018. On this page, we have specified the full details such as Education Qualification, Age Limit, How to Apply, Post Wise Vacancy Details, Pay Scale, and Selection Process. The aspirants who will apply for this Gandhinagar Municipal Corporation Recruitment must attend the Written Examination, and the Personal Interview to get hired into the organization. Aspirants have to check the official website of Gandhinagar Municipal Corporation for more information. It is a good moment for the candidates those who are eligible for the Account Assistant/ Junior Assistant positions and interested have to download the application form and fill the form in the provided format. From the official notification the aspirants who will select for Gandhinagar Municipal Corporation Clerk, Sub Inspector Jobs they will get the good pay scale offered by the Gandhinagar Municipal Corporation. Interested candidates can check the notification details from here or download the official notification and refer the information. 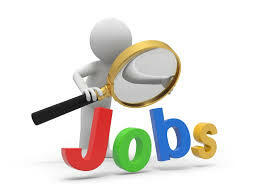 For more latest and upcoming job notifications job seekers can visit our website regularly. Go throughout this page fully for the more data of the Gandhinagar Municipal Corporation Recruitment 2018-2019. Aspirants must be passed Any Graduation or Post Graduation from any recognized institute or University. Visit the official notification for the age limit. The selection process will be based on written examination and Interview. Kindly visit the official notification to get the application fee details. 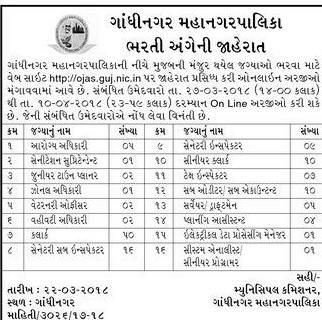 The Gandhinagar Municipal Corporation will pay the good salary as per their rules for the selected candidates. Starting Date of the Application Fee: 27th March 2018. Ending Date of the Application Fee: 10th April 2018. Go to the official website of Gandhinagar Municipal Corporation, i.e., ojas.gujarat.gov.in. Search for the Gandhinagar Municipal Corporation Recruitment 2018 Notification on the organization page. See the information in the official announcement. Candidates have to fill the application form and pay the application fee. Take a paper copy for the further use. We hope the above details of the Gandhinagar Municipal Corporation Recruitment 2018-2019 will be helpful for the candidates who are applying. Candidates can also check the results of the exam in Sarkari Result. Follow our website for more updates on Recruitment, Syllabus and Previous Papers, etc. Thank you.